"...a date that will live in infamy,"
including Pearl Harbor and initial attacks on American, British, Dutch, and Australian possessions. Naval HIstorical Collection, United States Naval War College, Newport, Rhode Island. FDR Addresses Congress: "... a date which will live in infamy"
No. 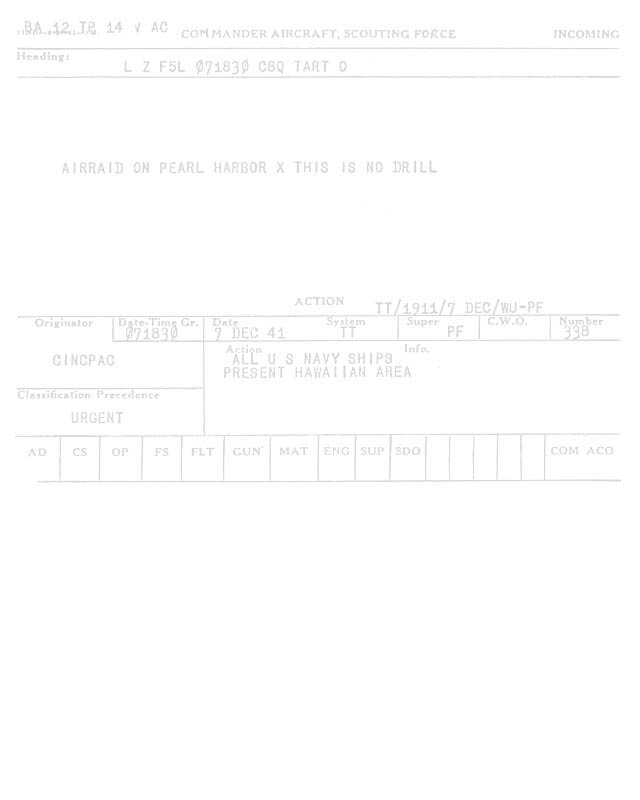 97--Pearl Harbor Operations: General Outline of Orders and Plans This monograph is a collection of Japanese orders and directives concerning the Pearl Harbor operation. The Coast Guard's Role in Hawaii During the Japanese Attack on Pearl Harbor, 7 D ecember 1941! Pearl Harbor Attack, Hearings Before the Joint Committee on the Investigation of the Pearl Harbor Attack (Washington, 1946). The Joint Committee hearings produced altogether 39 volumes, 11 of which contain the hearings themselves and 18 the exhibits presented during the course of the hearings. A separate volume, the 40th, contains both the majority and minority reports.